I'm still in mundane corporate housing and rarely cooking due to the awful kitchen and equipment. The fantastic news is that we have found a gorgeous house with the kitchen of my DREAMS, and we'll be moving the second weekend in November. Be patient, my dear readers. Things will soon get extra Scrumptious around here! 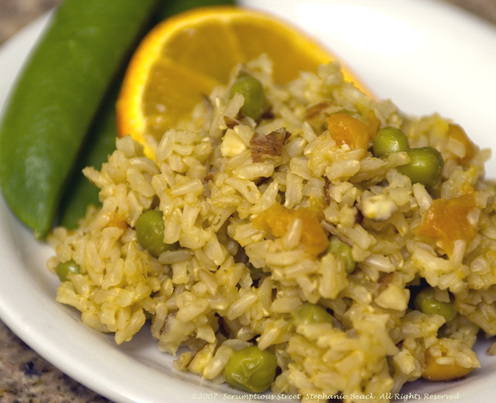 In the meantime, here's a delightful take on rice pilaf. This one is terrific for vegetarians and meat eaters alike. It's healthy, hearty and packed with flavor. I seasoned it in my own experimental style, using sweet fresh tangelo juice and tangy, spicy coriander. It was delicious and would go very well with poultry or pork, and you could easily play with the spices, sweetness or tartness a little more. This is my "Tangelo-Coriander Brown Rice Pilaf." 1. In a 3 qt. saucepan, combine rice, salt, vegetable stock and tangelo juice. Bring to a boil. Reduce heat, cover tightly with a lid and simmer for 25 minutes. 2. Add pepper, peas, apricot, coriander and taste for salt, possibly adding a little more, depending on the stock you used. Stir throughly and cover again, let simmer another 20-25 minutes until the rice is cooked but with a nice toothsome texture. 3. Remove from heat and let stand, covered, for 2 minutes. Remove lid, stir in chopped almonds and serve immediately.